For some reason, I've caught the "finish it up" bug! Yippee! I'm putting together some of those BOM quilts for which I've had all the blocks made for ages. 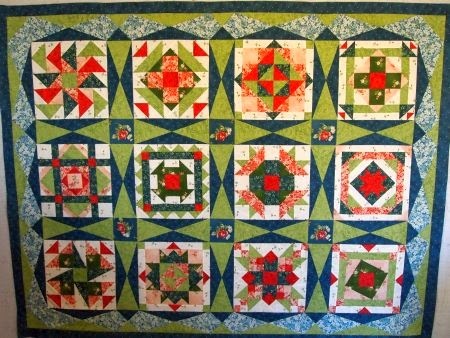 Yesterday I finished the 2010 Patchwork Party quilt. It's going to Cornelia on Wednesday to be quilted, so I'll save a photo for next Finally It's Finished Friday. Today I put together the 2013 Marti Michell BOM. It was the first time I used the "long skinny sashing stars" templates, and I admit, I had a bit of a time figuring it out. But once I did, I love the results! This may be my go-to layout for sampler quilts from now on! Two more borders and this one will go to the quilter! 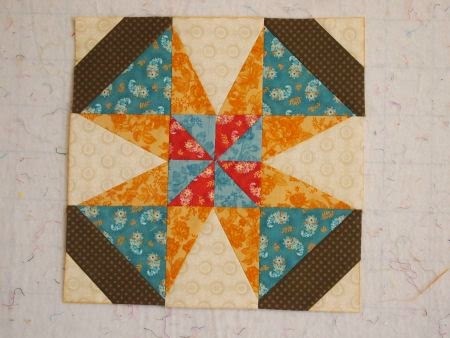 I love the 2013 Patchwork Party BOM -- mostly because all the pieces come ready-cut! If you notice a slight darkening on the edges of the blocks, not to worry. The pieces are laser-cut, and that dark line is where the laser burned the edges. But the dark part will be in the seam allowance, so it won't show when the blocks are put together. 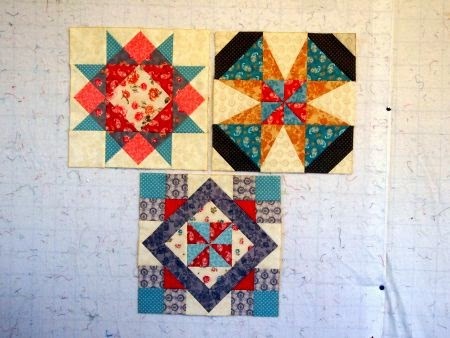 Clockwise from upper left, the blocks are from Fabric Essentials, Stitchin' Heaven, and The Quilt Place. The finishing kit I chose uses directions from Sharyn Craig. I took a class from her several years ago, so I know her finishing directions will be great. 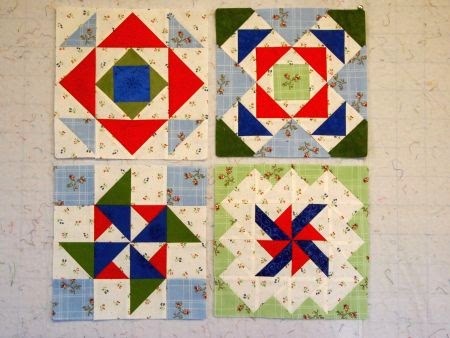 Rumor has it there are still block kits available, so go to Patchwork Party quick if you like these blocks! Here are the blocks I've completed for "5 is Fabulous," a Wednesday Block Party at Ruth's Stitchery. Again, clockwise from upper left, the blocks are: Cottage Mosaic, Ramblin' Around, Mixed Quartet, and Lookout Point. BTW, if you're making this quilt, be sure on "Lookout Point" that you arrange your pieces like the photo, not the drawing. Otherwise the center pinwheel isn't right -- ask me how I know that! The wind is whistling so hard in Colorado today that is is blowing open the doggie door! I'm hibernating in my sewing room to avoid being blown to Kansas! Such pretty blocks. That does make a great sashing for blocks like that. It's the time of year for cleaning and organizing-and putting quilts together;) Your quilt is lovely! I love the sashing and the border. I also enjoy looking at your blocks. It looks like red is your color.